Just off the west coast of the Greek mainland, the Ionian islands are a popular Mediterranean yacht charter destination. Known as “The Seven Islands,” the area also includes several islets around the larger islands that are perfect for exploring on side trips. 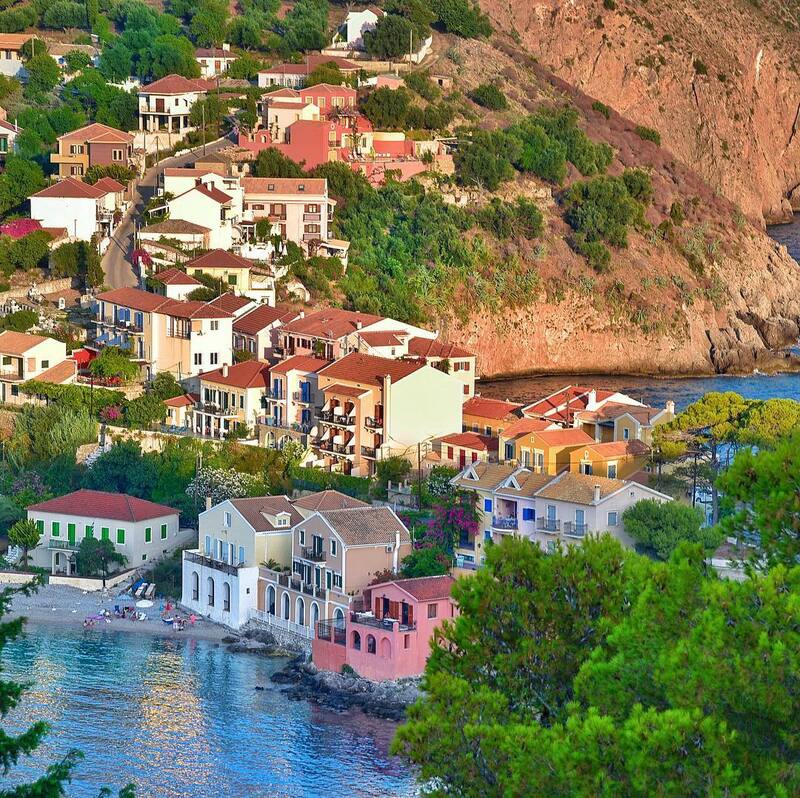 The climate in the Ionian islands during the summer and early fall remains relatively similar to the other Greek islands with highs of 70’s and 80’s during the day and lows in the mid-50’s and 60’s at night. And because the Meltemi winds are affecting the Cyclades and Saronic islands during the peak of summer, you’ll find much calmer breezes carrying you through the Mediterranean Sea. 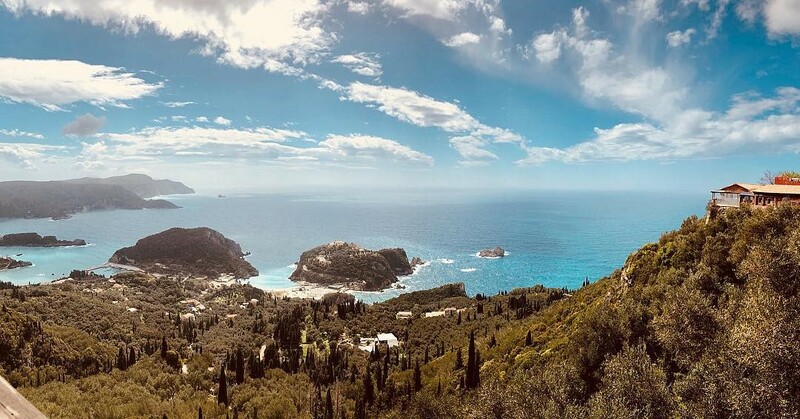 Of all the Greek islands, the Ionians have some of the most stunning natural wonders in Greece in the form of sea caves, mountains, and some of the most highly regarded beaches in the world. Along with the scenery, you can expect to enjoy many archaeological sites and ruins, castles and fortresses, and charming seaside villages with waterfront tavernas. So too will you find more of a French, British, and Venetian influence among these islands, especially at your base of operations, Corfu. It’s a fascinating place well worth exploring by yacht charter. Corfu. Photo by @nadiatanf. Used with permission. 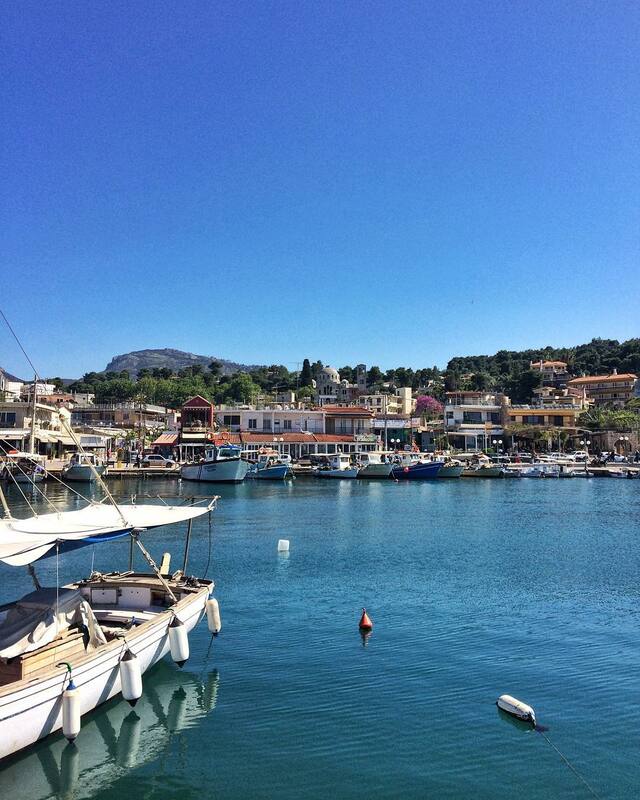 Depart from the hustle and bustle of cosmopolitan Corfu to Paxi and Antipaxos. The two small islands will enchant you with their sandy white beaches and beachside tavernas. On Paxi, you can explore the island’s coastal sea caves including the Grottee Azzurre or Blue Caves. Then head to the port town of Gaois with its sidewalk cafes, bakeries, and shops to experience the essence of true, Greek life. 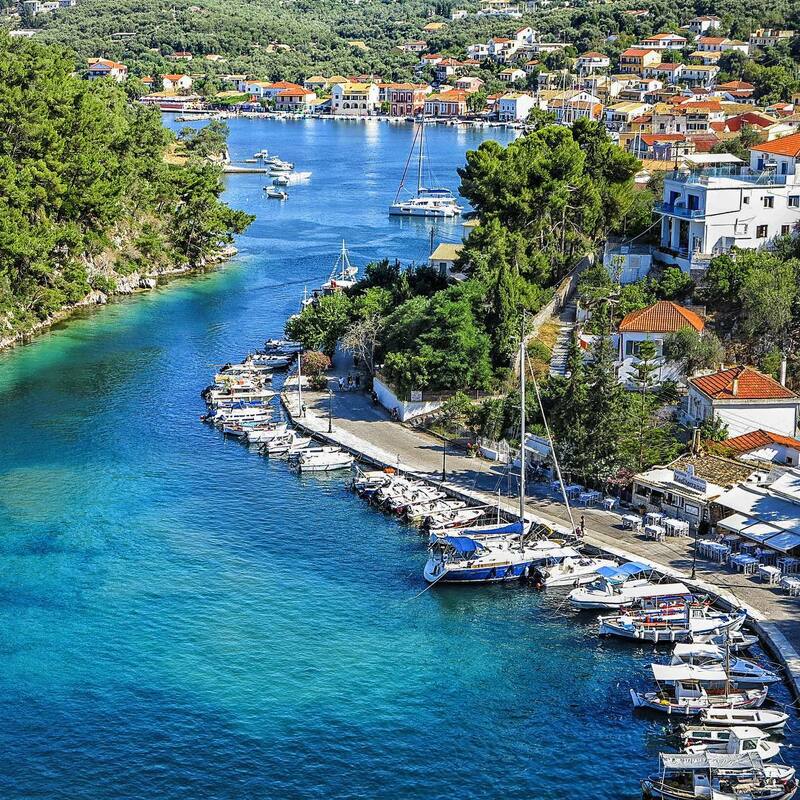 Only a short, four nautical mile trip on your yacht will bring you to Paxi’s sister island, Antipaxos. There you can swim off the back of the yacht or bask in the sun at either Voutoumi, Mesovikra, or Vrika beach. Antipaxos. Photo by @katerinakatopis. Used with permission. Paxo Island. Photo by @katerinakatopis. Used with permission. 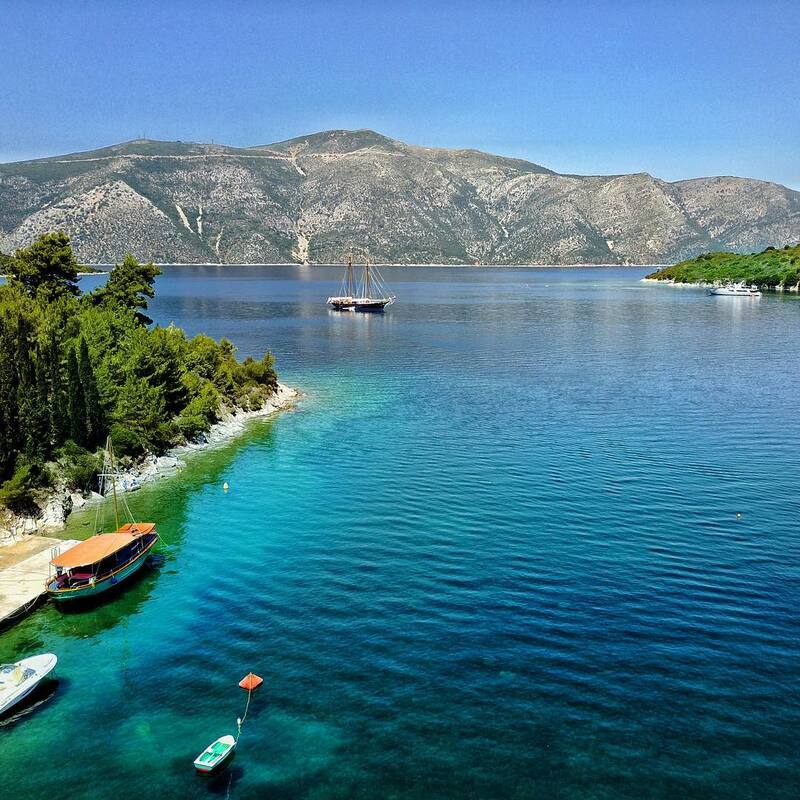 Set sail from charming Paxi to reach the shores of Lefkada. Here the water is a brilliant shade of blue and some of the most spectacular beaches in all of Greece can be found on the western coast. Egremni, Vasiliki, and the famous Porto Katsiki beaches are perfect for swimming and watersports like kitesurfing. Many smaller coves, lagoons, and islets also surround the island, which is connected to the Greek mainland. Equally fantastic are the gastronomic offerings, including wines made from special grape varieties only grown on the island and local delicacies like roe and fish soup. Lefkada. Photo by @matteoacitelli. Used with permission. The largest of the Ionian islands, Cephalonia’s stunning, natural beauty makes it a worthwhile destination. Hike up Mount Ainos, the tallest mountain in the region, swim in Assos Bay, and visit the Melissani Lake Cave. Then, head into Fiscardo, a fishing village in the North with colorful buildings all along the harbor. Make sure to enjoy fine dining and a swim at Votsalo Pool and Restaurant before heading to Lassi for drinks and lively nightlife. Cephalonia. Photo by @katerinakatopis. Used with permission. Upon arriving at Kalamos, a mountainous island directly east of Meganisi, you’ll immediately fall into the slow-pace of the sleepy town. Have a bite to eat at George’s, a dockside restaurant, which caters typical Greek fare to both locals and summer tourists. Wade in the crystal clear, shallow waters of the north shore on Episkopi beach or hike up to the pine forest, which is perfect for bird-watching. 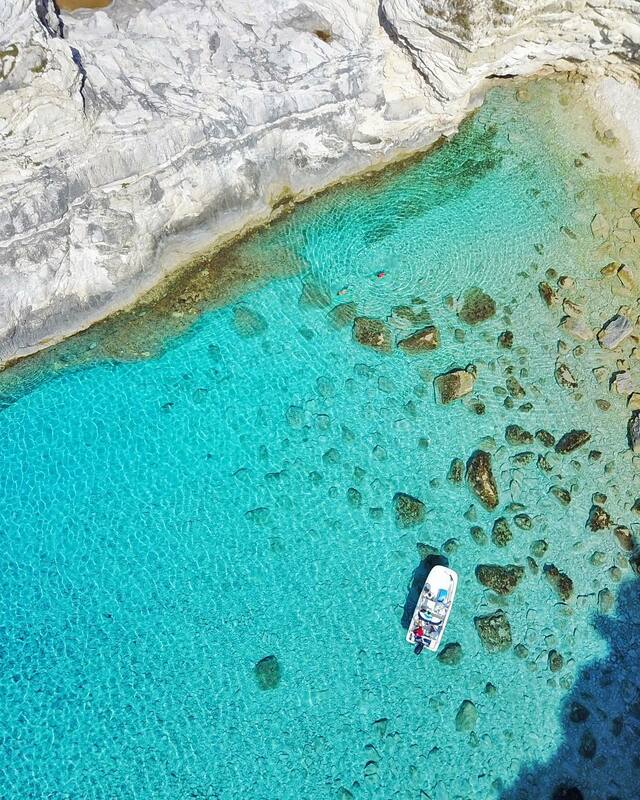 Then, jump back onboard for a short trip to Meganisi and make your way to the Papanikolis Cave, which you can kayak or even sail into (with a motor yacht). Kalamos, Greece. Photo by @my_nature_adventures. Used with permission. While you can certainly find beaches on Ithaca, this particular Ionian island was made for exploration. The island is very old and has many archaeological sites to explore including some like the Cave of Nymphs, King Odysseus’ Palace, and Homer’s School, which may have been locations from the Greek epic poem, The Odyssey by Homer. Many of the original artifacts found upon excavation of the ruins are found in one of the two museums on the island. Continue your day of peace and tranquility with a short trip to neighboring Kastos, where you can enjoy a drink as you unwind for the night at one of the small bars or tavernas near the water. For a unique experience, try Mylos cocktail bar, which is housed in an old windmill. 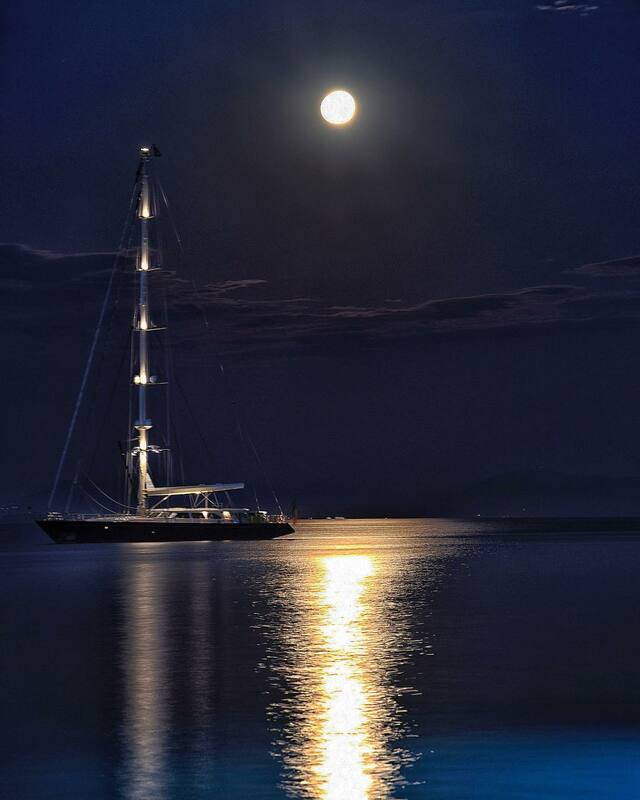 Ithaka, Greece. Photo by @katerinakatopis. Used with permission. Greece. Photo by @katerinakatopis. Used with permission. 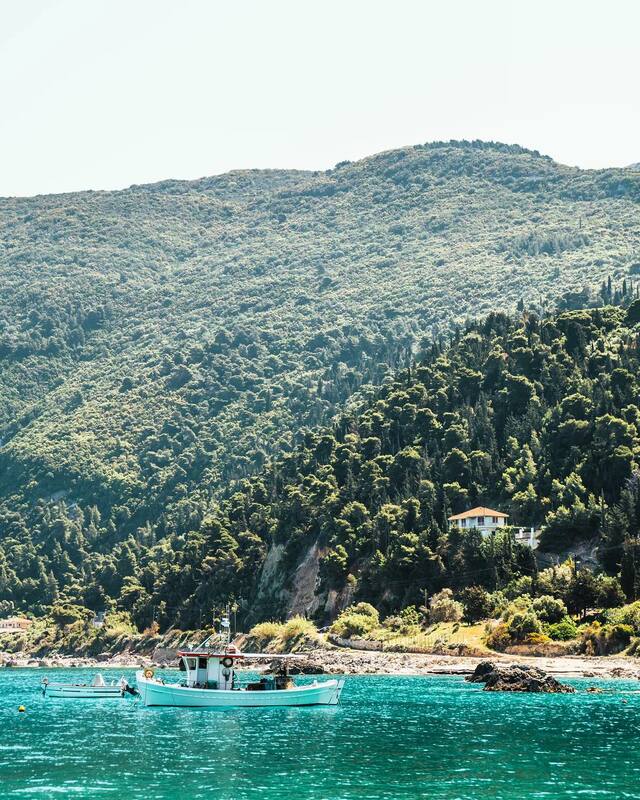 A modern, beautiful city, Preveza is home to an abundance of cultural and intellectual events and activities, playing host to a Jazz Festival in May and an International Choral Festival in July. The city has three impressive castles from the 1800s, museums, and other historic buildings including a cathedral with clock tower, a town hall, and an old marketplace. You’ll find the best restaurants in the latter, including Taverna O Kaixis, also known as The Mermaid, where you’ll often have live music to accompany your meal. Corfu. Photo by @katerinakatopis. Used with permission. You’ll end your yacht charter in Corfu, where you started—the gem of the Ionian Islands. Discover the island’s Old Town, a UNESCO World Heritage Site full of museums, Venetian houses, and fortresses from the 8th century. Corfu is filled to the brim with interesting history as it has been ruled by four different cultures over many centuries. Aside from wandering its narrow streets and Parisian-style arcades, you can also relax on the beach at Kassiópi—where a Byzantine castle towers from the hillside—before heading to the airport for your journey home. Which island do you find most enchanting? Whether you’re looking to spend most of your time in the water, dining on fresh seafood, or absorbing the fascinating history of the Ionian Islands, we can tailor an itinerary to your specifications. 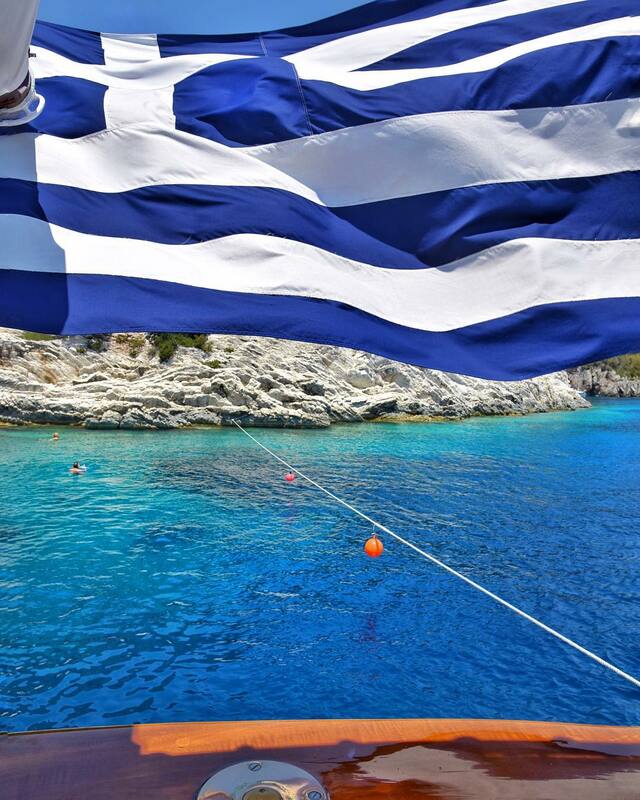 Check out our selection of yachts sailing to Greece, make an inquiry, and start your journey to embark on an Ionian yacht charter, today!